Local’s top choice for pizza & pasta restaurant in Laguna Beach! Gina’s Pizza and Pastaria is where the locals go for pizza and pasta! Why? Because their pizza’s are fantastic! To mix it up- they also serve salads, sandwiches, subs, and a wide-variety of pastas. This casual restaurant is a great place to dine in, or take-out and bring your meal to the beach. There are two locations in Laguna Beach (North and South) and each has both indoor and outdoor seating. If you’re thinking pizza… think Gina’s!!! Prices at Gina's Pastaria are exactly what you might expect from a local pizza joint! Gina’s Pizza and Pastaria Menu. The North Laguna Gina’s is located in the Von’s Center, so there is usually ample free parking in the shopping center lot. Metered parking available on PCH. There is also additional free parking in the residential neighborhoods behind, but make sure to be respectful & not to block anyone’s driveway! hours for the two locations are slightly different! 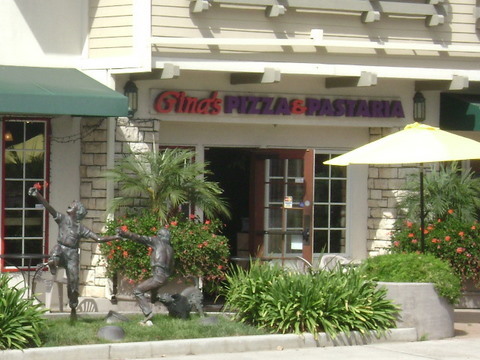 Share Your Gina's Pizza Experience or Review! Do you have a great story, experience, or photos from Gina's Pizza? Share your stories and pictures here! You can easily add a review for this Laguna Beach restaurant, just type in a title and click the link the below! Exploring the origins of pizza as convenience food all the way back to ancient Greece and Rome! With brief reviews of Romeo Cucina, Gina's, BJ's Chicago Pizzeria, and Z-pizza!